Saturday was a beautiful, sunny day, if a wee bit on the chilly side. We decided to take a drive to the Ross Park Mall/McKnight Road area to go to a couple of furniture stores and to the mall, which we visit maybe once a year because it just isn't convenient for us. Every time I go to the Ross Park Mall area, I feel like I am entering foreign territory! We live in Robinson, so the west is very familiar to us. We both grew up in McMurray, so the South Hills area is very familiar. SP lived in Squirrel Hill for many years and some family live there and in Greenfield, so the east is quite familiar. We've both worked downtown, so the city is familiar. I used to work in Cranberry, so Cranberry/Wexford is kind of familiar. But the Ross Park Mall area in the North Hills - it's foreign territory. I'm sure the traffic was not much worse than the usual Robinson weekend traffic, but it felt like it! Probably because we are used to it here and have learned some short cuts to stay off the main, congested roads. Our furniture shopping was not very successful, but we did have fun browsing through Crate & Barrel and Williams-Sonoma plus other stores before deciding around 5 pm that we were quite hungry. We had two gift certificates so we decided to choose between those two places: The Cheesecake Factory or Chili's. We decided to try The Cheesecake Factory since we didn't have to get back in the car and drive - we could just walk over. Of course the wait was an hour and a half!!! What is with that place that the wait is always so darn long? So SP whipped out Droid and called Chili's. They had only a half hour wait, so he put our name on the list and we drove over. What on earth did people do before smartphones?! Right away I knew this was going to different from our usual dining out experiences. We try to avoid chains other than local chains so I've forgotten what eating at one is really like. The noise. The small children. The small children who scream, climb on chairs, run around, bang silverware on the table. We waited about 10 minutes before being seated in a corner next to a bright window - good for photos but since I was a wee bit tired, a little too bright!! 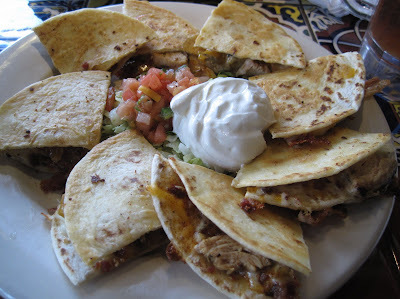 SP did his whole 'check into foursquare' thing and discovered that Chili's was offering a special of a free order of chips and salsa for your table. These were thin chips, which was a nice change from the thicker chips we buy at Costco. They were salty - - yummy but not good for you! The salsa was OK. 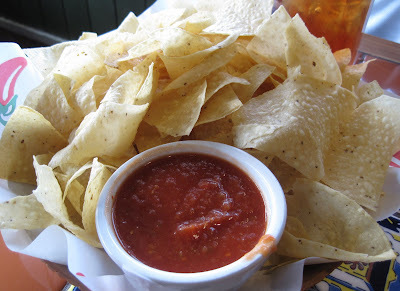 I'm a wimpy kind of salsa girl, and if I scooped up too much salsa it was a bit too hot for me. SP scooped up large globs of it and probably wished it had been spicier! 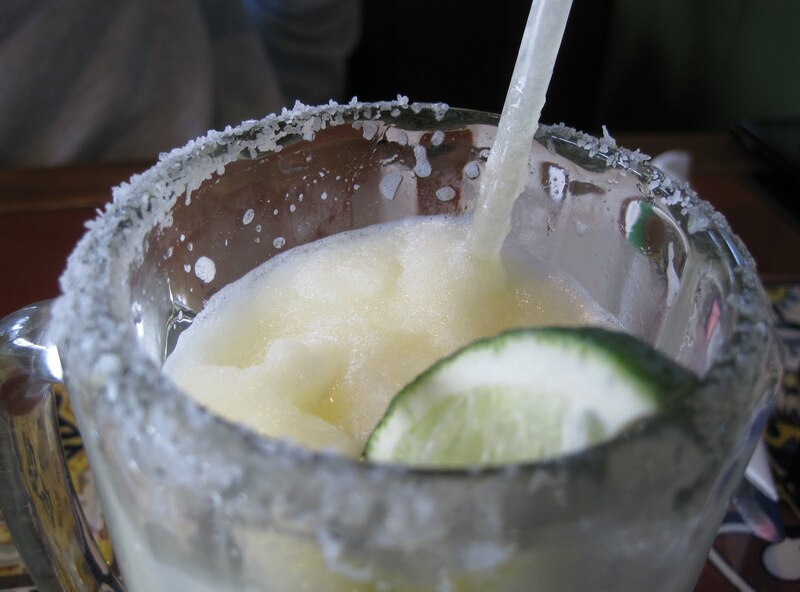 He ordered a frozen margarita to wash down his chips: It was huge, and not too bad. I had a few sips. Margaritas are not my favorite alcoholic beverage, and I usually prefer the fruity ones to regular ones, but they do taste extra yummy with chips & salsa. 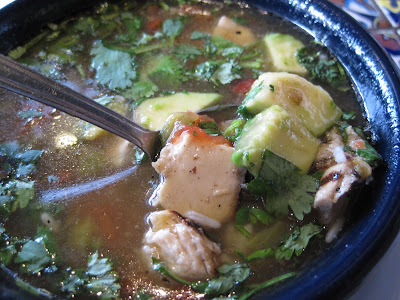 To start, SP ordered a cup of Chicken & Green Chile Soup: Along with the chicken and chiles there was rice, tomatoes, cilantro, avocado, and a lime wedge. He enjoyed it; I didn't try it. But I like the idea of avocado in the soup. 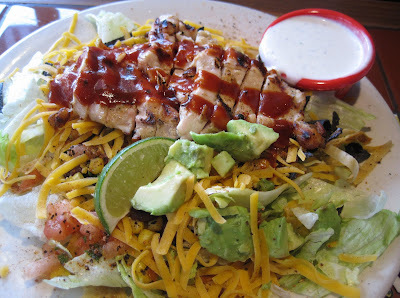 For his meal, he chose Grilled BBQ Chicken Salad: The salad had applewood smoked bacon, tomatoes, corn relish, cilantro, cheddar, house-made ranch and a drizzle of BBQ sauce. He said it was OK. He didn't eat much of the creamy ranch dressing. The lettuce was iceberg lettuce, but it was crisp and not brown. 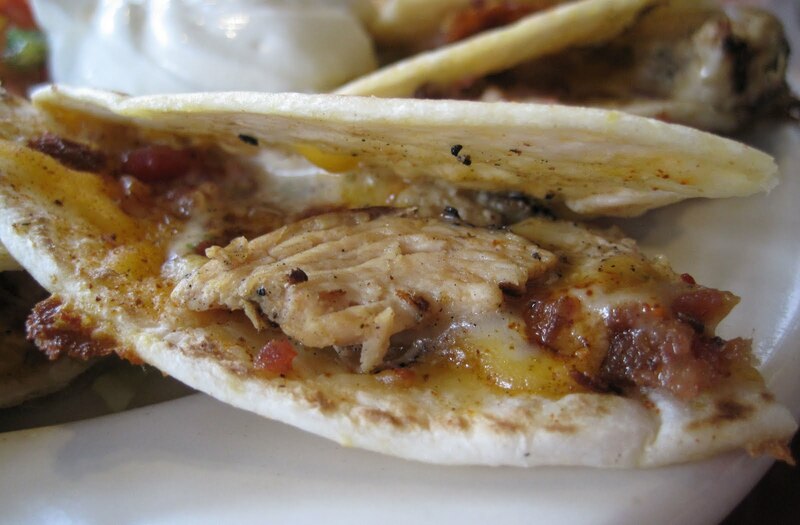 I chose Bacon Ranch Chicken Quesadilla: Along with chicken there was applewood smoked bacon and cheese, served with sour cream, house-made pico de gallo and ancho-ranch dressing. It was tasty, if totally unhealthy. I ate about half and brought the rest home for lunch on Sunday. It wasn't a bad dinner - it just wasn't very healthy! Our server was very friendly. 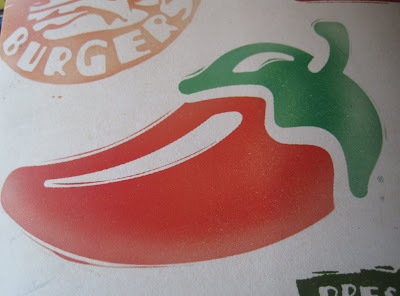 I probably would not have ever eaten at Chili's if not for the gift certificate we received, and I probably wouldn't choose to eat there again except for maybe when we're traveling and super hungry and don't want to take the time to research local places because we are so hungry and need food right that second! 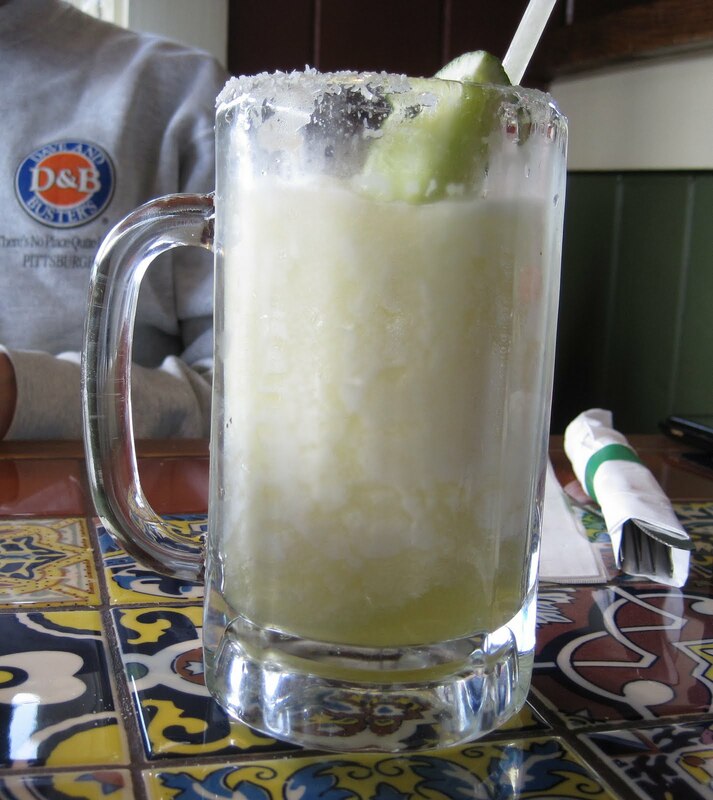 Chains have the capacity to be absolutely terrible, but there a few decent aspects to a place like Chili's. Lots of seating. Various menu options that are consistent in their preparation and quality. Etc. When you're starving for a meal and you've just got to settle on some place, any place, you could do a heck of a lot worse than Chili's.